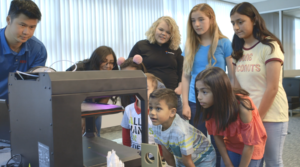 The unlikely partnership between an engineering company and a small tutoring center could not have been possible without their shared love of learning and passion for teaching a younger generation of future scientists, mathematicians, and engineers. The idea for STEM Academy was born during a lunch conversation between KETIV Technologies Inc. President, Kanwar Anand and Tutor Zone CEO, Manuel Bermudez. This discussion revolved around the lack of love for science, technology, and engineering in our communities. Both Manuel and Kanwar Anand, who had a son go through Tutor Zone academic program while in high school, agreed that they wished to see more students show a passion for learning in these fields. Kanwar invited Manuel to lunch where he shared his ambition to give young minds a greater exposure to the field of Engineering through the technology available at his company. Where Kanwar grew up in India, being an engineer was like being the next Michael Jordan while in the United States it is not seen as an exciting or cool career choice for young people. Both Kanwar and Manuel agreed to do their part to change that. Before approaching Tutor Zone for the partnership, Kanwar reached out to several local schools in the area with his idea to bring an exciting engineering program to their campuses. Kanwar offered the technology used in many engineering companies to the schools so the students could bring STEM concepts to life in the classroom. Unfortunately, the idea was shut down by the schools, who did not see enough value in the endeavor to get the program running. With giving the technologies to the local high schools out of the question, Kanwar came up with an exciting alternative-Tutor Zone. Because he had first-hand experience with Tutor Zone’s unique approach to education through his son Sehej’s tutoring, Kanwar believed it was the perfect place to launch his vision. With that, an unlikely partnership turned into a beautiful marriage between the two companies and from their follow-up conversations, STEM Academy was born. Since the initial idea was pitched, Tutor Zone instructors have been hard at work creating dynamic lesson plans that will coincide with the technology KETIV is providing. Manuel utilized Tutor Zone’s diverse staff to create a team of instructors who would be able to learn the new technology, deconstruct the science, math, and engineering behind it and create lessons that would be understandable for students of nearly any grade level. Through the marriage of education and technology, STEM Academy students of all ages will have the opportunity to learn important lessons in physics, algebra, geometry, engineering, and other STEM fields while also learning how to use engineering software to bring what they are studying to life. Each week, students will attend two hours of instruction at Tutor Zone and two hours of Learning Lab on the KETIV campus. While at KETIV, students will be able to take what they have learned at Tutor Zone and solve real-world problems using professional engineering software certified by KETIV engineers. Because success is no longer determined just by what you know but rather by what you can do with that knowledge, it is more important than ever for students to be able to use their knowledge to gather information, evaluate evidence, and solve real-world problems. For this reason, the STEM fields are increasingly important as they allow students to apply their knowledge of science, technology, engineering, and math in practical ways to solve critical thinking problems. Through this innovative program, Tutor Zone and KETIV hope to encourage students to optimize their creativity and explore new areas of interest they aren’t exposed to regularly.